The two early games in the Big Sky on Tuesday night did not turn out so well. 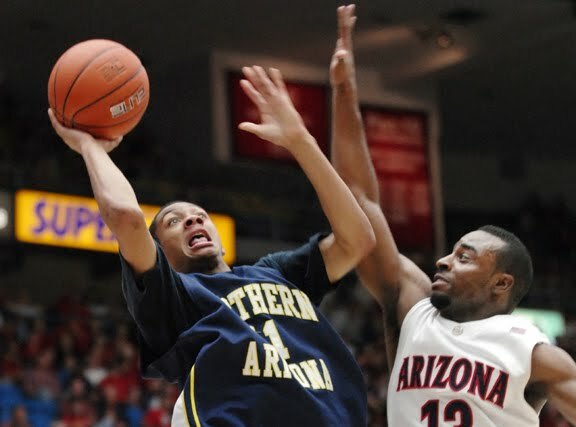 We hoped Northern Arizona would carry some momentum from their win against Arizona State into the game against Sam Houston State, but it simply did not happen. The Lumberjacks got blown out 73-49, as they were undone by a halftime score of 38-16. NAU struggled offensively (SHSU shot 52%) and offensively (shooting just 31.5%), losing a winnable game to a mediocre opponent. NAU got a solid game out of Durrell Norman (18 and 13), but beyond that, it is easy to see why they struggled so much. Gabe Rogers struggled mightily in his second game back, shooting just 1/10 and scoring 2 points in 26 minutes. Stallon Saldivar, fresh off of the best game of his career, was 1/5, scoring 3 points to go with 4 assists. Those are their two big leaders, and they need them to be there if NAU is going to be competitive. The Bearkats improve to 4-7, while NAU drops to 4-8. After a great start under interim coach Dave Brown, they will have to go into the Christmas break with this taste in their mouth. I did not expect Montana State to go into New Mexico and beat the Lobos, but I did think they would keep it reasonably competitive. No such luck, as they fell 91-46 in Albuquerque, including getting outscored 53-16 in the first half (!). Combining this with their loss to Pepperdine, and it is has not been a very good week for MSU. It is tough to find bright spots for Montana State. They shot 30% from the field, even worse from downtown, and allowed New Mexico to play a brutally efficient offensive game. If you look deep enough, you can see that Tre Johnson had a nice night with 16 points and 6 rebounds, and Christian Moon hit four threes, but those are about the lone bright spots. For Montana State, it was not long ago that I was wondering if they were the second best team in the Big Sky. Suddenly, they look like a fringe Big Sky tournament team.